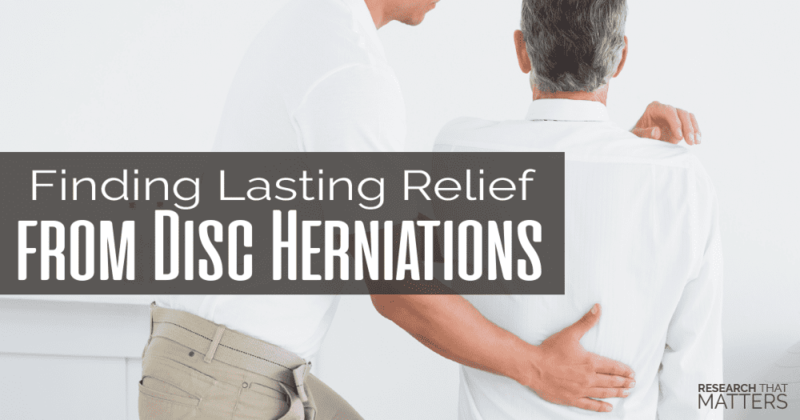 Here is a great article from Andrew Lock over at Kabuki Strength discussing 3 cases of disc herniation rehabilitated with strength training and proper movement! 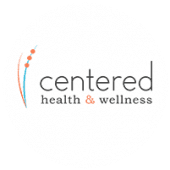 This is our Bread and butter at Centered, we work to improve your pain by improving how the spine moves (segments), posture and movement. Strength is a science. Rehabilitation from Low Back Injury is a Science. 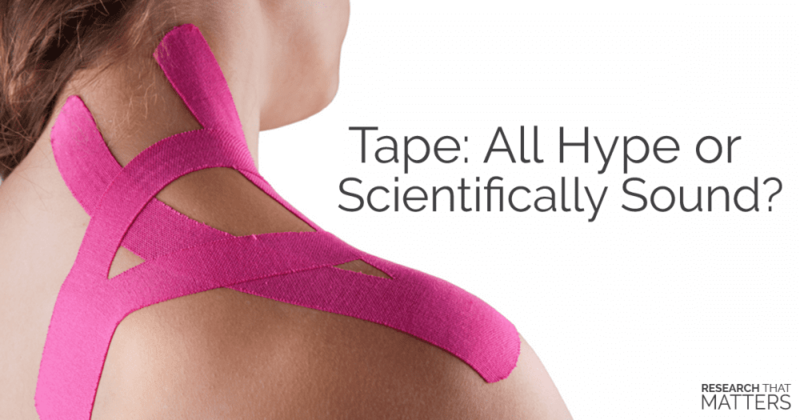 Yet when it comes to low back rehabilitation the health professions (Physical Therapy, Chiropractic and others) seem to turn to anti-science principles and embrace faith based systems. It’s time for the tide to turn. The science that is unnegotiable in medical methodology, is the same science that is unnegotiable in successful rehabilitation. I teach rehabilitation based in the science principles of anatomy, physiology, hypothesis creation and hypothesis testing. The same principles that underlie strength coaching. The further proof of the failure of ‘modern’ machine based spinal rehabilitation methods came walking through my door recently. A person had made an appointment to see me, he had been doing Keiser training to “strengthen his low back” 2-3 times per week for the last 3 years. 4 weeks before seeing me he had gone to his Keiser Training Centre and got strapped into a lumbar extension machine and as it flexed him forward he felt a “pop” and immediate pain. An MRI taken a few days later showed what had been postulated could happen using this equipment, did in fact occur. 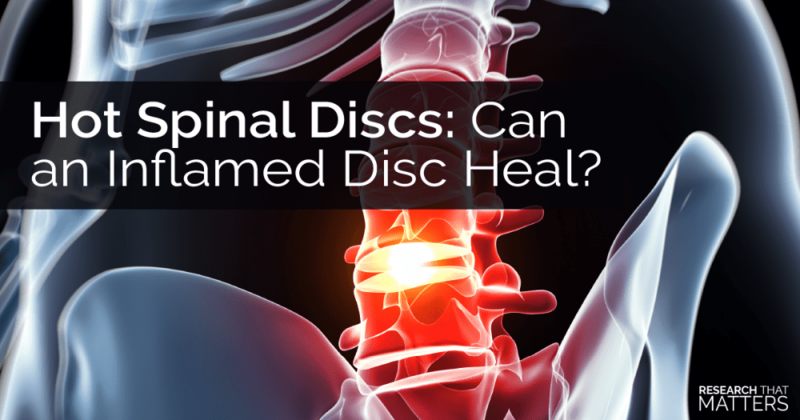 He had blown a disc using the very equipment he believed was supposed to be helping him. Here is his MRI. 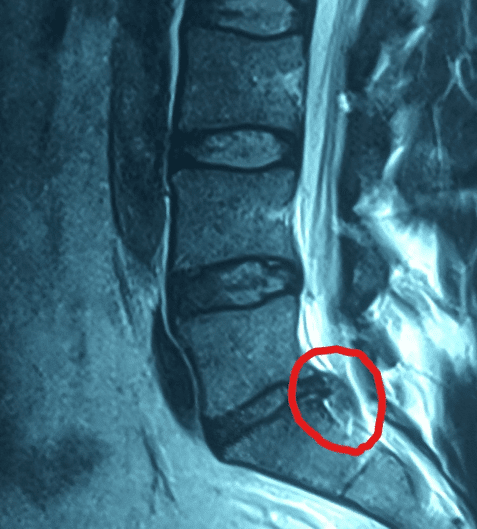 I’ve circled the huge disc injury that resulted from being flexed by equipment. Now the mechanism of this type of disc injury has been demonstrated by Professor Stuart McGill (Callaghan and McGill. See comment in PubMed Commons belowClin Biomech (Bristol, Avon). 2001 Jan;16(1):28-37) in his lab. This study showed that a disc only has a certain amount of flexion tolerance under load. The greater the load the less the tolerance to repetitive flexion. When you combine Wilke’s disc pressure study, where the disc pressure has been measured to be more than double when sitting flexed compared to standing (Wilke et al, Spine 24 No.8 1999), with McGill’s flexion tolerance study– it appeared inevitable that this type of injury could occur. Repetitive flexion under load in sitting! Who would think that is a good idea? Can you imagine that these people actually appear to have no understanding of the hip hinge principle yet try to ‘strengthen’ low backs by loading lumbar flexion? With apparently no understanding of the science based movement patterns that are central to the strength education system, groups such as Pilates and Kieser sell methods to the public with the same glazed eye devotion as the Hare Krsnas dancing down the city streets banging tambourines and burning incense. Delusions are always happier amongst company. But here is the most relevant window from the Kieser injury scans. But what is most shocking is the picture above! This guy had approximately 400+ sessions over 3 years of Keiser and he had only about 50% of the muscle he was supposed to have built! Almost NO multifidus at all. 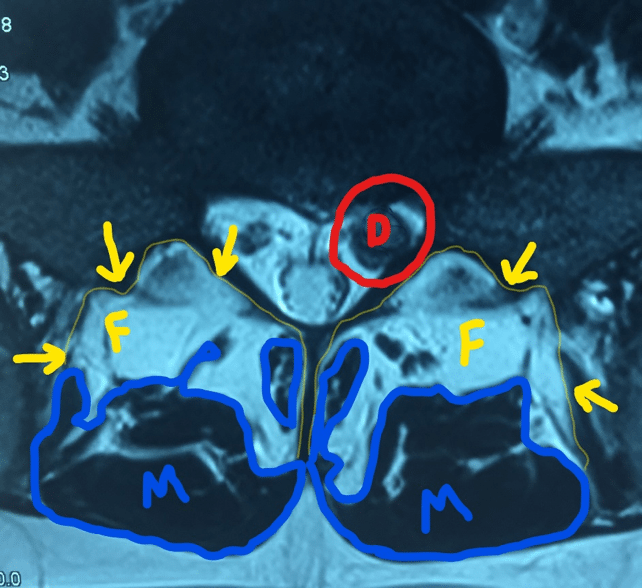 He had attended this training method to build his lumbar musculature, in line with research that demonstrates the multifidus muscle (closest to the spine) tends to atrophy after low back injury. 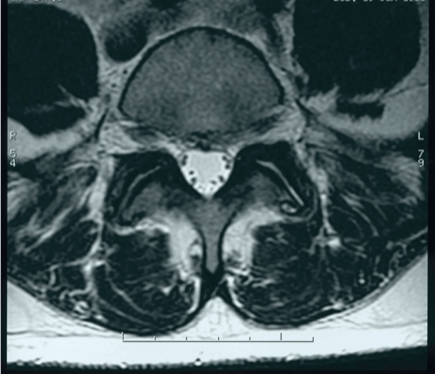 (Nerve root impairment leads to atrophy of Type I and II fibres, with structural changes in the multifuidus muscle only at the innervated level. 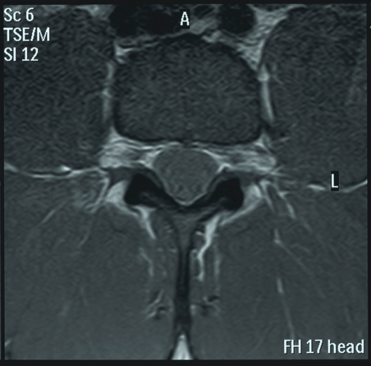 Oshihara et al Spine 2001). Yet this method failed to produce multifidus growth, and the mechanism of repetitive flexion under load produced a large disc injury. You can see the enormous amount of fat around his spine – THAT SHOULD ALL BE MUSCLE! If he had deadlifted for those 400+ sessions he would have erectors like a Bull Elephant by now. The ‘machine’ failed to produce the muscle necessary for spinal protection. He had almost no multifidus muscle here after 3 years. Combine this with my already presented evidence, in previously published articles, on how Pilates also fails to produce meaningful muscle hypertrophy, as below where you can see the white fat within the muscle, and you will understand that these two popular methods of rehabilitation are greatly lacking in the basics of the strength systems familiar to most strength coachs. Read my prior articles on this if you have not yet done so. Why is it then that the Health Professions who deal in Low Back injury seem to be oblivious to the benefits of correct progressive weight-training, the principles that strength sciences embrace. Basically for two reasons that I see. When a Health Professional graduates they see themselves as a member of a group. Chiropractor, Osteopath, Physical Therapist etc. This immediately constrains an individual to a method of thought that tends to comply with the education they were given. As such when a patient came and told me she had seen “Everyone” for her 4 year odyssey with low back pain before coming to me. I said to her “So you saw an Osteopath?” She nodded and I responded “He told you that you had a Sacroiliac joint problem didn’t he” She smiled and nodded as I continued “You saw a Chiropractor who introduced himself as ‘Doctor’ who then put your X-rays up and showed you what was wrong with your spine and how it needed ‘adjusting’” Her eyes opened wider as I continued “Then you saw the Physical Therapist who stuck ‘dry needles’ in your tight glute and told you to do ‘Pilates’ right?” She gasped and said “How did you know”, I told her “Because it appears that’s pretty much the standard practice of each of those professions”, I continued “and that is why you have now come to see me”. When I teach other professionals strength training and movement pattern evaluation, I teach without ‘Religion’. I adhere to the principles that science makes unnegotiable, strength science is not based in opinion, and it is based in science fact. Although I have been educated in the Physical Therapy stream and licensed in both the USA and Australia, I lost my ‘Religion’ in my journey and committed myself to the ‘scientific method’, that means I questioned everything I was taught. That also meant I studied more of everything related to back pain, I have bookshelves groaning under science and research publications. My rules are “What does the science say?” and “Prove it”. You want to tell me your disc has ‘Slipped’ I won’t argue, I’ll ask you to prove it. The onus is on you. When I teach the onus is on me, I have to be able prove every point. The Health Professions largely do not understand weight-training methods. It’s pretty obvious that if Physical Therapists tell you to do Pilates then they clearly lack basic science in understanding production of hypertrophy, strength or skill acquisition. 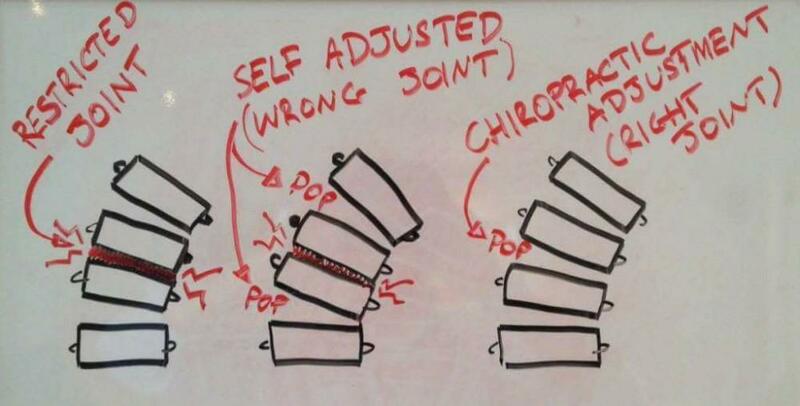 If a Chiropractor thinks that cracking your back is going to regrow atrophic multifidus then they are really living in Wonderland. If an Osteopath just massages and stretches you and thinks that will restore muscle size then that too is delusional. Unless your health professional knows progressive weight-training resistance methods and movement pattern evaluation you will not produce the required changes to prevent further low back pain. The statistics are clear that at least 90% of all people who have an episode of low back pain will then have more episodes! The Health Professions and their narrow views are not preventing ongoing problems, they often just simply ‘treat’ your pain. 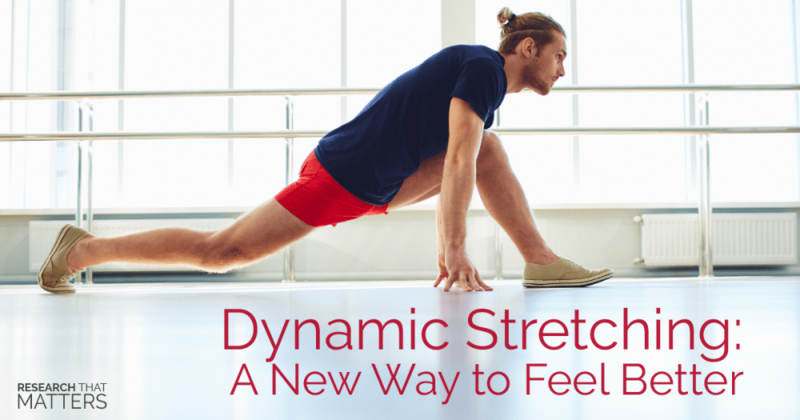 Movement patterns are the key to pain free life. 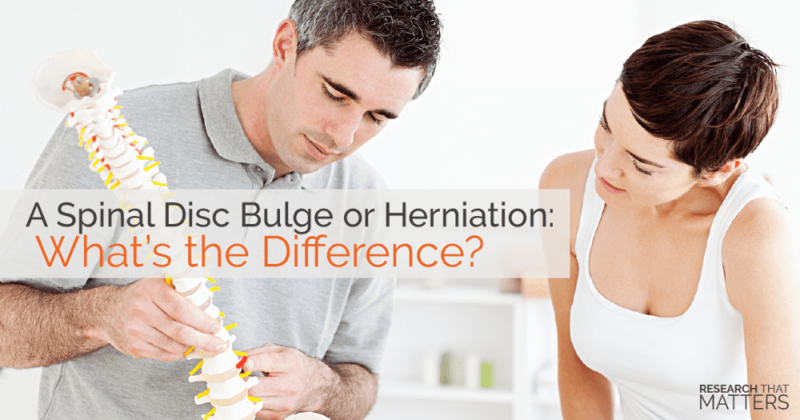 Lumbar disc injury is, in the majority of cases, a result of 3 factors. Understand the deep sciences behind each of these factors and you will be able to identify the causative agents of the problem! There is little place for passive ‘treatments’ in lumbar spine rehabilitation. I teach the methods of progressive exercise prescription (Strength Training) to identified deficits in the patient’s assessment and evaluation. This is the same methodology strength coaches should use when programming. You need to understand the cost of each muscle you use, its compression and its shear force production. You need to be able to test these out using a clear assessment protocol and hypothesis creation. Strength training for low back pain is a science. You need to learn anatomy and physiology, you need to understand the principles of strength and hypertrophy production, you need to understand correct human movement patterns, and you need to be able to evaluate anthropometrics when applied to lifting, and most importantly a paradigm of injury assessment. There are few professionals out there who are this experienced. I never said this education is easy, but if you are committed to the unnegotiable path of excellence then the journey is enjoyable. You want the results such as I helped to produce below. Total paravertebral muscle established. The only equipment used here was barbells and kettlebells. This result was achieved by progressive applied weight-training science, assessed at an individual level and applied in a perfect program! Strength, apart from being a skill, is a science. Strength sciences applied to lumbar spine rehabilitation is the only rational path to success. Success being defined as resolution of pain and achieving the goals the patient needs for return to their athletic endeavor!